Bob Brewer debunks a few of the common myths associated with dark beers. On February 5, 2015, Anchor Brewing Company announced the release of Flying Cloud San Francisco Stout, which first saw the light of day last year as the third release in our Zymaster Series of limited edition brews. We have covered the subject of porters and stouts, as well as the history and inspiration of Flying Cloud, in previous posts, but I’d like to shine a little light on the subject of dark beers in general. Today, even with the rising popularity of craft beer and some Belgian styles, the overwhelming majority of beer produced in the world is light in color. Although no one really knows for certain, the ancient beers of Mesopotamia and Egypt were probably somewhat pale as well. What we do know is that the malts used in early British and Continental brewing were somewhat crudely kilned which resulted in darker roasts that produced darker beers, hence the early popularity of Porters and, eventually, Stouts. The industrial revolution brought more sophisticated kilning equipment and controlled processes that allowed for more specific ranges of malt to be produced. This gave the brewers of the day much more to work with and they began to create increasingly diverse styles of beer. British brewers began to produce pale ales which eventually overtook Porters while the stouts hung on somewhat. When the Germans got their hands on new lager yeasts, their brewing rapidly turned to lighter beers, along with a few special styles of dark such at Schwartz bier and bock. By the early 1800’s the march to the light was on its way. Coming of age in the 1960s and 70s, people of my generation had little choice in beer. Domestic beer was, with few exceptions, pale yellow lager. There were a handful of popular imports available and they were mostly pale yellow lagers, too. But there was a subtle light at the end of the tunnel for those of us who were looking for a darker beer. Importers began to bring in “dark” versions of a number of products, which gave us Heineken Dark, San Miguel Dark, Lowenbrau Dark, and Becks Dark, among others. And, of course, there was always Guinness. But they were sometimes hard to find and not really that popular even though these beers, with the exception of Guinness, were typically just the regular beer with some caramel coloring added. Seasonally, a few of the big breweries had produced a bock, but this disappeared sometime in the 70s. The last gasp of domestic dark beer, also merely a caramel-added product, was the pizza joint that usually had one on tap. I remember Pabst, Schlitz, and Falstaff each had one. 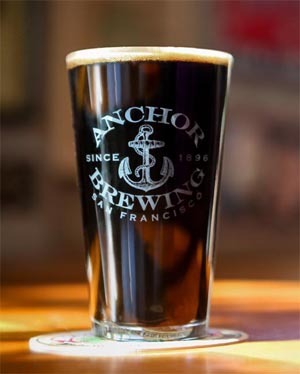 Anchor even had a dark version of Steam Beer back then. These were rarely, if ever, bottled and disappeared along with the disco era, never to be seen again. I was a big fan of the dark stuff. It actually tasted a little sweeter than the regular beer and I thought it made me cool and eclectic. The popular mythology surrounding it also gave me a tough guy image. I turned it all into a cool, eclectic, intellectual, “tough guy” persona. I drank dark beer therefore I was cool, smart, and tough – and don’t you forget it. So let’s get back to all that popular mythology stuff. In the early days of the 20th century American culture, “modern” processed foods were seen to be superior to the older, traditional, unrefined products. By the 1950’s things that were brown or black were old-fashioned and things that were white and light were contemporary and better for you. Wonder bread was building strong bodies 8 ways and mom cut the crusts off of your PB&J. Whole wheat brown bread was out. We had white rice. Macaroni and processed cheese. Only Grandma used brown sugar., etc., etc., and sadly the same became true for beer. Well, we all know now how all that worked out when my generation finally smacked some nutritional sense into the public consciousness and gave the country craft beer along the way. A couple of the more positive legacies of the rebellious 1960’s for sure. Having said that, I must admit that there are some old notions about dark beer that stubbornly persist to this day. I’ll once again try to debunk some of them. Myth: Dark beers are higher in alcohol than lighter beers. Fact: They can be, but the color of a beer has nothing to do with its alcohol content. Myth: Dark beer has a harsher and stronger flavor than lighter beers. Fact: Color has no flavor. Although some dark beers can have a more robust character, many are quite smooth and are more pleasantly balanced than many IPAs. Myth: Dark beer has more calories than lighter beers. Fact: The amount of calories in a beer can certainly vary, but color has nothing whatsoever to do with it. Dark beer having a higher caloric content is an assumption made by those who buy into the higher alcohol myth. Myth: Dark beers are cold weather beers. Fact: Dark beer is great anytime. 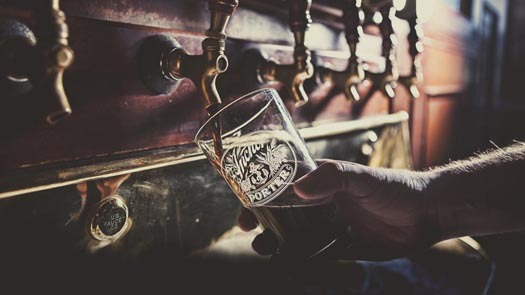 While a stout or porter might not be the most refreshing choice for some people on a hot summer day, you don’t have to be standing around in a snowdrift in January to enjoy an Anchor Porter either. The pub, as well as your house, probably has both air conditioning and heating so seasonal temperatures don’t really matter. Now for some fun ones. How they persist, I don’t know. Myth: Bock beer is made when the brewery is cleaning the vats, or is the dregs from the brew house, or comes from some such or other vaguely defined but unappealing brewery process. Fact: Bock is a traditional German spring seasonal beer produced by the usual impeccably high standards that German brewers hold to. This myth is born out of ignorance. I first heard it from an uncle over 50 years ago and he probably got it from my Grandfather – and they were second and third-generation German Americans. When you think about it, it’s really silly but I have people ask me about it even today. Myth: The Irish invented stout. They’ve been making Guinness since forever. Right? Fact: This one’s historical and not flavor-related, but I like to mention it because it’s a common misconception. Stout is a British creation that evolved from Porter. In fact, they were essentially the same beer with interchangeable names for a long, long time. The Brits introduced stout to the Irish (remember they ruled Ireland for 400 years), who brewed their own versions. Guinness became what the world knew as stout largely because of fact that the British exported it to the far corners of the Empire. There’s also Beamish and Murphy’s stouts which we don’t much hear about because the Brits didn’t bother much with them. They’re a little different from Guinness – and from each other – but share the same British heritage. Myth: Dark beers – stouts and porters, and especially Guinness – are supposed to be served warm. Fact: Perhaps the biggest myth of them all. These days, it seems that only some Americans think this. I know where this idea came from, but it baffles me that it’s still hanging on. In England and Ireland, before the advent of mechanical refrigeration, beer had been stored in cellars. The climate over there is temperate to cool year around and the 55-ish degree cellars were considered perfectly normal for beer storage, so they saw no need to invest in expensive refrigeration when it became available. Over here, we had prohibition from 1920 to 1933, after which all beer was stored cold because new, modern breweries were being built and that’s what Americans wanted: cold beer. During WWII lots of Americans experienced cellar-temperature beer for the first time and associated it with things Irish and British. They didn’t like it much but they drank it anyway. Expat Brits were used to warm(er) beer and always moaned that Americans were doing it all wrong so the owners of “authentic” pubs here started serving Guinness a little warmer. But the world doesn’t stand still and these days when you go in to a pub across the pond, Guinness is served cold. Sometimes there are two taps side by side. One will offer “regular” Guinness (it’s in the refrigerator), and the other will offer Guinness “Extra Cold.” Hardly cellar temperature. Dark beers should be served at whatever temperature you prefer them to be, not what somebody says they should be. To say things have changed with dark beer in America since the 1950s is a colossal understatement. Evolving full-circle from classic styles to caramel-added versions of regular lagers and back around to their origins, giving rise to an array of new interpretations along the way, dark beers have something for every craft beer lover. Even if they seem to be the least-favored in the line-up of most craft brewers in the day of IPA and other craft favorites, they have much to offer. If you haven’t had a dark craft beer lately, or any other dark beer for that matter, it’s time to re-visit them. If you don’t buy into the old conventional thinking you might be surprised by what you find. There’s a bold new world of beer out there, so don’t be afraid of the dark. I never have been and that’s why, 45 years along, I’m still cool, tough and smart. Here in CEE (central and eastern europe) we have a rich history of dark beers, especially lagers. The rumour has it the dark beers are sweeter, therefore more appreciated by women. Unfortunately this is true for a very bad reason – artificial sweeteners. Big multinational brewing companies indeed put aspartam in dark beers to be “sweeter” and better accepted by women. I personally know several dark beers that were not much roasted or astringent that pale beers, because the dark malts were only added late in the brewing process to only provide colour. However if done in a wrong way, dark beers can be harsh to palate and even unintentionally sour. As for Anchor Porter, this is a good example of a well-balanced beer that is dry, sour, straightforward and salty, without much fruit such as dried plums so typical for continental porters. I found it very drinkable and liked it a lot. Thank you for this article. Related to the “warm beer” question, I find that I usually prefer porters and stouts to warm up in a glass a bit; the flavors seem to open up and develop a bit and gets more interesting. I always felt it was because the beer needed to warm up for the flavors to develop, but your post has me wondering if maybe it’s not the temperature at all, but rather the exposure to the air. Either way, it seems to taste better (to me) if I let it sit for awhile before I drink it. Can you shine a light on why this might be? Also, what might be another myth: back thirty or so years ago when I first began drinking dark beers, a common reaction from friends was, “you’re going to drink that straight? You’re supposed to mix it with light beer!” I never did, but what’s up with that? I recall that we served Guinness at Faire for a time. I always enjoyed it on draft, but was disappointed in the taste of bottled Guinness. Was there something added to the bottled version as preservative or something? It seemed to have a sharp or bitter note not present in the draft product. Thanks. I learned a couple of things. I love dark beer for the most part. The Flying Cloud was really nice. I enjoyed it in my backyard while grilling and sitting in front of the chimnea. Perfect.